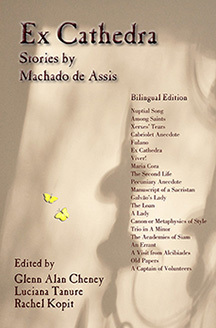 Ex Cathedra is a collection of short stories by Brazil’s most renowned writer, Machado de Assis. Literary critics consider Machado to be among the hundred best writers in the history of Western literature. Most of the stories in Ex Cathedra had never been translated to English until New London Librarium published this collection. Its 21 stories were translated by scholars in four countries. Caetaninha pulled the book from his hands. Her godfather got up, walked around, ducked into his study, where he did not lack books, shut himself in and continued reading. It was his vice. He read with excess, read morning, noon and night, at lunch, at dinner, before sleeping, after a bath; he read walking, read stopped, read at home and at the country house, read before reading and after reading, read the whole cast of books but especially law (in which he had graduated), mathematics, and philosophy. Lately he was also given to the natural sciences. “What’s your name?” she repeated, scared. “Your name is Fulgêncio. And, burying his face in the book, he went on with his reading. Caetaninha referred the case to the slave women of the house, who told her they’d noticed something wrong for some time, that he wasn’t right. Imagine the girl’s fear. But the fear passed quickly, leaving only pity behind, which only increased her affection. And besides, the mania was narrow and slight. It never went beyond the books. 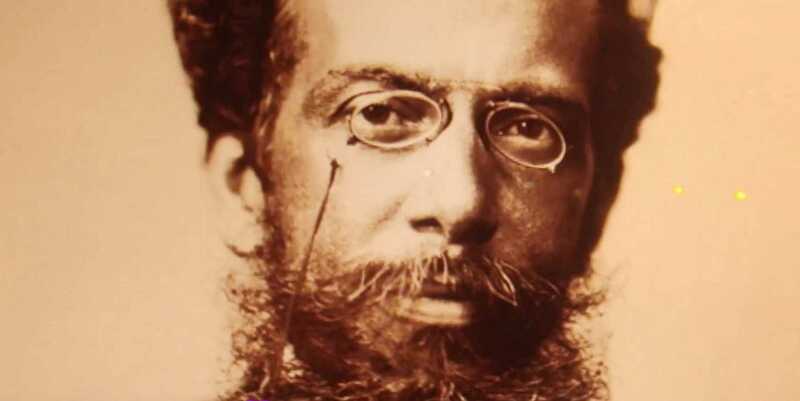 Fulgêncio lived for the written word, the press, the doctrinal, the abstract, the principles and formulas. In time he came not to superstition but to hallucination of theory. One of his maxims was that liberty never dies where there’s still a sheet of paper on which to declare it. And one day, awakening with the idea of improving the condition of the Turks, he drew up a constitution which he sent as a gift to the English minister in Petrópolis. On another occasion he immersed himself in the study of books on the anatomy of the eye to verify whether they really can see, and he concluded yes. Tell me where, under such conditions, the life of Caetaninha could be happy. She lacked nothing, it’s true, because her godfather was rich. It was he himself who had raised her since she was seven, when he lost his wife. He taught her to read and write, French, a little history and geography, to say the least, and he had one of the slave women teach her embroidery, needlepoint, and sewing. All of this is true. But Caetaninha turned fourteen. Though at an early age toys and household slave women were enough to entertain her, she reached an age where toys fall out of fashion and slave women are less interesting, where no readings or writings make a paradise out of a lonely house in Tijuca. She went out on a few occasions, rarely and quickly; she didn’t go to plays or dances, didn’t visit or receive visitors. When she saw a cavalcade of men and wives pass by, she put her soul in the saddle and let herself go, leaving her body at the feet of her godfather as he continued to read. One day at their country home she saw a young man mounted on a little beast stop at the gate, and she heard him ask if that was the house of Dr. Fulgêncio. Caetaninha responded that she would see. She entered the house and went to the study, where she found her godfather mulling, with a most voluptuous and saintly expression, a chapter from Hegel. Young man? What young man? Caetaninha told him it was a young man in mourning clothes. Mourning? repeated the old doctor, suddenly closing the book; it must be him. I forgot to tell you (though there’s time for everything) that, three months earlier, a brother of Fulgêncio, in the north, had died, leaving one natural son. Since the brother, before dying, had written to him to recommend the orphan he was to leave behind, Fulgêncio sent to have the orphan come to Rio de Janeiro. Hearing that there was a young man there in mourning clothes, he concluded that it was his nephew. And he didn’t conclude badly. It was him. It seems that up until this point there’s nothing that doesn’t fit into a fondly romantic story: We have an old lunatic, a lonely and sighing young woman, and we see a nephew show up unexpectedly. In order to not descend from the realm of poesy in which we find ourselves, let it be said that the mule on which Raimundo arrived was led by a black from whom he’d hired it. I’ll also bypass the circumstances of the accommodations for the young man, limiting myself to saying that, living to read, like the uncle, having completely forgotten that I had sent for him, nothing in the house was prepared for him. But the house was big and well stocked. An hour later, the young man was settled into a beautiful room from which he could see the country home, the old cistern, the washtub, plenty of green foliage, and the vast blue sky. I believe I still haven’t said the age of the guest. He’s fifteen and sprouting a shadow over his upper lip. He’s almost a child. Later, if our Caetaninha is overcome, and the slave women go around spying and talking about “the nephew of the old sinhô who came from somewhere out of town,” it’s because life there didn’t have much happening, not because he’s a made man. This was also the impression of the master of the house, but here’s the difference. The goddaughter wasn’t aware that the job of that shadow is to become a mustache or, if she thought about that, did it so vaguely that it isn’t worth putting here. It wasn’t that way to Fulgêncio. He understood that he had there the dough of a husband, and he resolved to get them married. But he also saw that, unless he took them in hand and kneaded them, happenstance might lead things in a different fashion. One idea begets another. The idea of marrying the two jibed with one of his recent opinions – that calamities or simple unpleasantness in matters of the heart happened because love was practiced empirically. It lacked a scientific base. A man and a woman, once they understood the physical and metaphysical reasons for this sentiment, would be able to receive and feed it more effectively than another man and woman who knew nothing of the phenomenon. He was dizzy, dazzled, delirious. He went to the shelves, pulled down a few tomes, astronomy, geology, physiology, anatomy, jurisprudence, politics, linguistics, opened them, flipped through them, compared them, here and there extracted bits, until he formulated a teaching plan. It had twenty chapters in which entered general notions of the universe, a definition of life, proof of the existence of man and woman, the organization of societies, a definition and analysis of the passions, a definition and analysis of love, its causes, necessities, and effects. In truth, the subjects were tough. He understood how to tame them, turned them into ordinary, everyday sentences, lending them a purely familiar tone, like the astronomy of Fontenelle. And he said with emphasis that the core, not the skin, was the essence of the fruit. All of this was ingenious, but here’s the more ingenious thing. He didn’t invite them to learn. One night, looking at the sky, he said that the stars were shining a lot – and what were the stars? By any chance did they know what the stars were? From here it was just a step to begin a description of the universe. Fulgêncio took the step with such agility and so naturally that he left them enchanted, and they asked for the whole journey. Thus it was that he began, surreptitiously, to execute his plan. Every day the two students, amazed by the world of astronomy, asked him to go on, and even though in the end of this first part Caetaninha got a little confused, she still wanted to hear about the other things her godfather had promised. I’m not saying anything about the familiarity between the two students since it’s obvious. Between fourteen and fifteen years of age, the difference is so small that the bearers of the two ages didn’t need to do much more than one offer a hand to the other. That was what happened. After three weeks, they seem to have been raised together. That alone was enough to change Caetaninha’s life. But Raimundo brought her more. Within ten minutes of watching her look longingly at the cavalcades of men and ladies who passed by on the street, Raimundo ended her longing, teaching her to ride despite the reluctance of the old man, who feared disaster. But he gave in and hired two horses. Caetaninha had a beautiful riding jacket made, and Raimundo went into the city to get her some gloves and a crop with the money from his uncle – as you know – who gave him boots and the rest of the masculine accoutrement. Soon thereafter it was a pleasure to see them both, gallant and intrepid, up and down the mountain. At home they played freely, played checkers and cards, took care of birds and plants. Often they bickered, but, according to the slave women, they were make-believe fights, only for them to make up afterward, a passing peevishness. Sometimes Raimundo went into the city, sent by his uncle. Caetaninha waited for him at the gate, watching anxiously. When he arrived, they argued because she wanted to take the largest packages from him under the pretext that he was tired, and he wanted to give her smallest ones, alleging she was a weakling. At the end of four months, life was completely different. It could even be said that only then did Caetaninha begin to wear roses in her hair. Beforehand she often showed up for lunch with her hair unbrushed. Now, not only was her hair brushed early, but even, as I said, she brought roses, one or two. Either she picked them herself the evening before and kept them in water, or he picked them that same morning to bring to her at her window. The window was high, but Raimundo, standing on tip-toe and raising his arm, managed to hand the roses to her. It was around that time that he picked up the habit of smoothing his filmy whiskers with his finger. Caetaninha took to smacking his fingers to get him out of that bad habit. Meanwhile, the lessons continued regularly. By then they had a general idea of the universe, and a definition of life, which neither of them understood. Thus they came to the fifth month. On the sixth began the proof of the existence of man. Caetaninha couldn’t suppress a laugh when her godfather, expounding on the topic, asked them if they knew that they existed and why, but she quickly got serious and answered no. “Nor I, sir,” the nephew agreed. Fulgêncio usually began conceptually, with deeply Cartesian reasoning. The next lesson was at the country house. It had rained a lot the previous days, but the sun now flooded all with light, and the country place seemed like a beautiful widow who changes her mourning veil for that of a bride. Raimundo, as if he wanted to emulate the sun (the great tend to copy each other), sent out a vast and faraway look from his pupils. Caetaninha took it in, throbbing like the country home – a fusion, transfusion, diffusion, confusion and profusion of beings and things. While the old man talked – straightforward, logical, stalwart, enjoying the formulas, his eyes fixed on nothing – the two students made thirty thousand efforts to listen, but thirty thousand events distracted them. At first it was a pair of butterflies who played in the air. Do me the favor of telling me what could be extraordinary about a couple of butterflies? I agree that they were yellow, but the circumstances aren’t enough to explain the distraction. The fact that they flew one after the other, now to the right, now to the left, now down, now up, does not explain the detour, seeing that butterflies never fly in a straight line like simple soldiers. Raimundo looked at Caetaninha and found her looking at him. They both seemed confused and shy. She was the first to lower her eyes to her lap. Then she raised them to look somewhere else, somewhere far off, the wall around the grounds, but as they went there, since Raimundo’s were still there, she looked off as quickly as she could. Fortunately, the wall presented a spectacle that filled her with wonder. A couple of swallows (it was a day of couples) hopped around on the wall with the grace of people with wings. They peeped as they hopped, saying things to each other, whatever it was, maybe this – that it was quite nice that there was no philosophy on the walls of country homes. But when one of them flew – probably the lady – the other, naturally, the boy, did not let himself fall behind. He spread his wings and went the same way. Caetaninha lowered her eyes to the grass on the ground. A few minutes later, when the lesson was over, she asked her godfather to go on. When he refused, she took his arm and asked him to take a walk around the grounds. “It’s rather sunny,” the old man argued. In that way the two bugs spoke. She heard them ruminating. As soon as they disappeared, she went into the house, saw the time and left the bedroom. Raimundo was out. She went to await him at the gate, ten, twenty, thirty, forty, fifty minutes. When he got back, they spoke little. They came together and separated two or three times. The last time it was she who brought him to the veranda to show him an ornament she thought she had lost and had just found. It does them justice to believe that it was pure lie. Meanwhile, Fulgêncio moved the lesson up, gave it the next day, between lunch and dinner. Never had the word left him so lucidly and simply. And that’s the way it should be. He talked about the existence of man, a deeply metaphysical chapter, in which it was necessary to consider everything from all sides. And the lesson went on to an end. At the end, the same thing happened as on the day before. Caetaninha, as if afraid of being alone, asked him to go on or to take a walk, and he refused both, patted her paternally on the cheek, and shut himself in his study. “This week,” the old doctor thought, giving the key a turn, “this week I go into the organization of societies. All next month and the next is for the definition and classification of the passions. In May, we will move on to love . . . by then it will be time . . .
As he said this and closed the door, something echoed from the veranda – a thunder of kisses, according to the caterpillars of the yard, but for caterpillars any little sound is worth thunder. As for the authors of the sound, nothing is known for sure. It seems that a wasp, seeing Caetaninha and Raimundo together on this occasion, concluded a consequence from the coincidence and understood that it was them. But an old grasshopper evinced the inanity of that conclusion, alleging that he had heard many kisses, a long time ago, in places where neither Raimundo nor Caetaninha had ever set foot. We agree that this other argument was worth nothing, but such is the prestige of good character that the grasshopper was applauded as having once defended truth and reason. And from that it can be that that’s the way it really happened. But a thunder of kisses? We suppose two; we suppose three or four.